Like the clapping crowd, Mayor Billingsly was already drunk from the tub gin Amos Walton had been making all Summer long. Dolly was happy her boss didn’t mess up his first duty for the day, but she needed to make sure he made his way through the rest of the day’s obligations. He still had to hand out the trophy at the zombie chuckin’ competition, put the first rubber band around the undead man’s head at the “How many till it pops?” tent and the one he was most looking forward to, hosting the Miss Post-Apocalypse McKohn County pageant. “You need so slow it down sir,” she said, pulling him off the platform. “Sir, there will be another on next Fall.” November was the perfect time for the event. It was right before the welcome of winter where the remaining zombies would freeze and give the survivors some respite. Thought it was be impossible to use Microcosms default prompts of double decker bus and children without it turning into Harry Potter and Prisoner of Azkaban. “Now sit still.” The nurse pressed Rollie’s arm against the padded bar. The bus was full of ten year-olds with June birthdays going through the same procedure. Even though the Faceless arrived on Earth with the gift of anti-gravity technology, they didn’t bring a better way to inject tracking chips into their subjects. The syringe bores were as large as the straws used to puncture their allotted calorie bags. Made these little do-dads with some pull quotes from recent reviews. Definitely going to use them in the back of my new books. I started writing this for Microcosms, but I went off the given theme and well past the word count. Unable to reign it in for competition, I decided to love it as it is. Enjoy. “There is a thirteenth floor,” The elevator man yawned. Every summer the Grand Bohemian was inundated with wealthy guests, all bringing their miserable children with them. “Steer clear of the door,” Clive announced, simultaneously twisting the lever holding out his hand for the bribe. The nameless boy parked the twenty spot into the man’s glove. The elevator man stopped the lift deftly between the twelfth and fourteenth floors and pushed the boy aside. The gate opened to a locked door. With a twist of the key from Clive’s ring, the thirteenth floor opened up to them. The floor was completely unlike the others in hotel. Except for the support beams, the floor plan was completely open. Long rectangular wooden crates lay evenly across the floor like dominoes on a table. The boy cautiously stepped from the elevator while Clive remained inside. “That’s baloney,” the boy turned, his confidence wavering. “Is it?” Clive shut the gate before the boy could stop him. After lowering the lift two floors he could no longer hear the brat screaming. He didn’t need the twenty dollars before, but it made it easier to walk out on this miserable job at the Grand Bohemian. It's been a few weeks, but I've contributed to Microcosms this week. Yes, I included this in the Guns, Gods & Robots universe. The line moved fast. Each customer queued up, shouted their order and slid their credit cards through the payment slot. Five minutes later the Tyson.2’s arm thrust out of the autocart service window with the kebobs ready for each patron. It was efficient, perfect and most importantly: cheap. All of the food carts had followed the restaurant automation trend that had in turn followed the robotics revolution over the last decade after Farage’s Folley. The one piece that couldn’t be automated was trash. Legally. Sanitation careers were one of the government’s preserved job types saved for people to make their career. Winston stood outside of the autocart waiting for customers to throw their skewers and napkins onto the ground. Even though the trash bin was five meters away, customers preferred to discard their debris on the pavement. The emergence of mass-sloth was another unexpected consequence of a fully automated society. Winston twisted his spine. The vertebrae popped. His back ached every day from bending over for the trash. Despite the misery of his job, he kept at it. One day he would afford his own Tyson.2. Never on his trashman’s wage, but through a bigger plot he’d been hatching since he’d the Department of Livelihoods been assigned to serve the autocart. Like he had every day for the last month, Winston feigned dropping one of the skewers so it rolled under the cart. Once under, he’d stab the break line just once. At the end of his shift he’d lay down, out of sight of the driving system’s cameras, and hope for a mistake. Maybe today he’d have his legs run over. Maybe today he’d earn his workers comp and a better future. Writing military things, isn't quite my forte, but giving it a shot for this week's Angry Hourglass. Trying out a new flash prompt site: 200 Word Tuesdays. This month's prompts are nostalgia and empty fields. The lines were blurring. Save for a few naps, he’d been at the terminal for a week straight, hunched over and massaging the coding to make certain it was perfect. The last time Clip-12 hustled this hard was when he was working on mastering his debut album for StyleStrong records. At the time they called it a hungry album; the work of a young man making a name for himself. The rumors of his debauched, party-addled hot tub lifestyle grew as large as his album sales. He loved it despite it mostly living in the imaginations of his fans. Young artists, like his son, coming up today had to actually live legendary lifestyles on social media to even have enough street cred to sell albums. He surrounded his station with magazine cutouts of rappers, like his son, that had died chasing that same notoriety online. It kept him motivated. In the void left by his son Clip-12 dedicated himself to learn coding. Matching his passion for that first album he’d devoted himself to writing an HTML string that would effectively command the internet to delete itself. It was time. He kissed the cross on his neck and tipped his ball cap to the faces on his wall before striking the enter key. The field, and eventually the whole screen emptied. I've lapsed lately , but contributed a short blog entry over at OpenBooks.com. Click for a little insight into the process I took to make physical copies of Guns, Gods & Robots. It's been a while since I've participated in Angry Hourglass. Here's this week's entry. Pine ash smelled the best. In the quiet hours after his parents were asleep, Elliot would reach up under his bed and remove his glass vials, examining each one. He imagined himself in a movie of his life: twisting the lids off of each and sniffing the trophies within. His eyes would roll back in his head with the smell of the sooty remains of each conquest. That’s how villains were depicted and he didn’t disagree with the portrayal. He took his pen out and re-labeled one of the vials that had smeared after months of handling. The masking tape on each was clearly noted with the date he’d set each fire. Some fizzled out after he’d fled the scene, but most got the job done. The land was cleared and progress could be made. It was much easier, and cheaper to clear burnt trees from the land with a bulldozer than pay a whole team of loggers to do the same. The feds were less inclined to fight to keep the burnt remains of their preserves. His parents used to fight. Now they didn’t. Elliott solved that. They were an odd couple that the local press loved to profile. The Park Ranger who fell for the land developer. The better they got at their jobs and the more promotions they received, the more obligated they were defend their employers positions at work and ultimately at home too. Dad used to take his work home with him, complaining that mother’s company was pushing too hard to cede too much from the preserves. Mother fought back that he had more than enough land to share. Every night ended in a yelling match even after Elliott retreated to his room. Take your children to work day changed everything for Elliott. In seeing each of his parent’s work first hand, he’d come up with the solution: Fire. If he noticed their tensions flare up he’d sneak out and make a solution. The pit in his stomach ached, so Elliott sniffed the vials again easing the pain. He’d practiced his story again and again with his parents for tomorrow’s deposition with the fire marshal. My sci-fi and horror collection, Guns, Gods & Robots, has reached the next stage of evolution: paperback! If you can't get to your favorite indie bookstores in NYC, you can order direct from Amazon and other online retailers. GGR is always available for your eReader at the online bookstore of your choice. 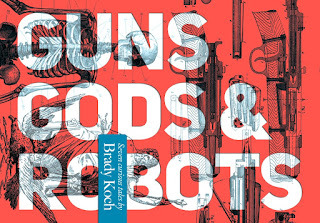 Order Guns, Gods & Robots from Amazon. ". . . mind-bending, intelligent, and enjoyable; each story is multi-faceted and brilliantly written." I have three new, unpublished stories in the third volume of the FlashDogs anthology: Time. 100% of proceeds go to charity, so not only do you get some new horror, sci-fi and crime writing from me, but you also get to support giving children access to books in developing countries through The Book Bus. Download FlashDogs Volume 3: Time here. In between my bigger publications I'm always writing Flash fiction to stay sharp. I've compiled a year's worth of my flash fiction into a free collection for NoiseTrade and OpenBooks. "If you like Monty Python, you might really like this book." What were Broadway tv commercials like before stedicams were able to run all around the bellowing characters on stage? New short stories, flash fiction, writing notes and more! Selling books on eReaders is fun and all, but nothing beats seeing your work at the bookstore. 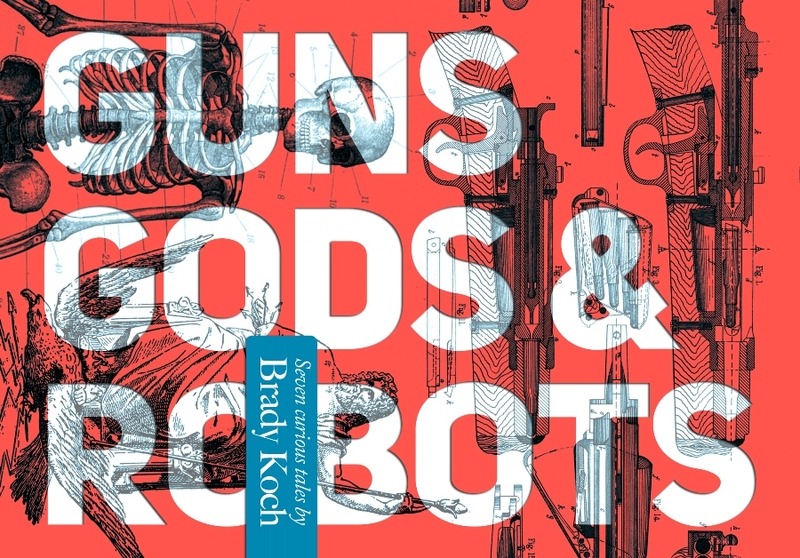 I'm pleased to announce that Guns, Gods & Robots is now available in paperback at select indie bookstores in NYC as well as online at Amazon. The perfect gift for all the little creepies in your life! Wait till you all see how justified the text is! This week's Microcosms was hard to cut down from 130 words to 100. It was bad enough Marla had to sneak chicken nuggets at the school cafeteria, now she had to look at the elephant with no trunk. The other exhibits at the zoo were as depressing: the fox looked like it’d crawled from under a running lawnmower, the lions had three eyes between them and someone had flipped the alligators on their backs. “Isn’t this beautiful?” Dad asked. “Sure,” Marla sulked, looking at what had become of her college fund. She refused. He’d replaced every zoo animals he’d liberated with taxidermies from bankrupt museums; an obsession to become the leading vegan activist on the talk show circuit. The final story/component for this week's Microcosms prompt. Archimedes danced in her head as the ocean surface rose above her. In these last moments, she only wanted her daughter, not the man whose laws were sending down into oblivion. The density of the escape pod wasn’t enough to counter the water weight it had taken on in the downpour overhead. Captain Darla fought against her safety harness. Amidst the chaos, an old pain formed in the astronaut’s knees. Eureka. A memory knocked out by the violent impact returned. Reaching between her knees she pulled the secondary release. The chair uncoupled sending away from Archimedes and toward the surface, rescue and ultimately her daughter. 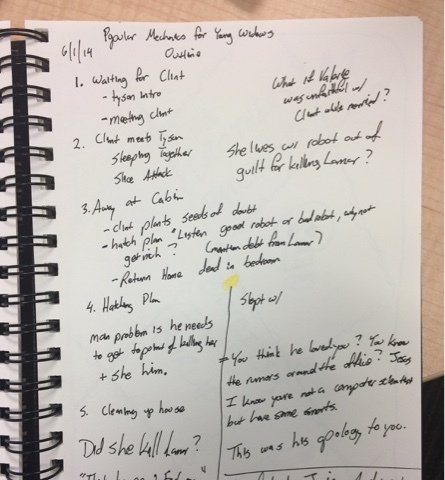 After the first story on this week's Microcosms, I thought it would be fun to see if I could write four independent stories that could also be strung together to become something bigger. Here is #3 this week. Darla’s knees hurt against the steel grid of the launch pad flooring. Her flight suit wasn’t made for saying good bye to five year olds. She stood back up and gave her husband a final kiss in the cheek. They’d said their goodbyes last night. Her daughter pointed at the thunderhead forming in the distance. Darla bent and kissed her on the head one final time. It would need to last her a whole year. Going for 2 at this week's Microcosms. The spheres were perfect floating in front of the crew’s faces. Other astronauts looked to the stars for proof of a higher power. Captain Darla found her creator in the flawlessness in these translucent orbs. Water had gone everywhere. Larger globules were the result of a friendly water fight celebrating their return to Earth after a grueling year in orbit. The smallest spheres: her tears in knowing she was never returning to space. The water shifted unnaturally, then accelerated uniformly toward her. “We’re gaining gravity!” She didn’t know who screamed, but someone seized her and threw her into the nearest escape pod as an electrical fire lit through the cabin. Got one in a little earlier than normal for Microcosms. In her last video log for her daughter, Captain Darla remarked how cumulus clouds looked just like mashed potatoes from her vantage point on the space station. Underneath, bobbing on the ocean waves strapped into her emergency capsule, the clouds looked heavy; threatening to fall and crush her. She struggled against her harness, certain her femur had shattered with the impact. The captain felt what she most feared hit her cheek: a raindrop. The sprinkle accelerated into a downpour. Her safety belt was jammed. Panicked, Darla redoubled her efforts to escape from the safety device before the pod filled with water and dragged her to the bottom of the Pacific. This week at Microcosms the default prompt included SteamPunk. I just can't do that to myself again, so I re-rolled. Amos was still blocks away from the table where the kindly old woman at the front of the bread line would hand him a stale loaf. It was barely fit for ducks. The Depression hardened his little heart almost as much as his parents abandoning him at the church. It was time to test the treasure he’d found in the burnt crater behind St. Germain’s this morning. Amos held up the glass disc and pressed the protruding button. A green arc of light struck the hunched man in front of him. The man evaporated, leaving a pile of dingy clothes. Amos stepped forward and waited for the device to recharge. Another week, another blog for OpenBooks.com. This week I talk about my strategies for walking away from a story that's just not working out. Another week of Microcosms Flash Fiction. A reminder that I need to pick up the pacing on my own short run flash fiction comp. I have the sites all lined up. I just need some art and and some automation and we're good to go. This week's prompt included steam-punk BTW. It's my Kryptonite. Seems like Batman v. Superman is also Superman's Kryptonite. Zing!? The long range copper scope on the carbine had done the trick again. The zeppelin was a grand way for any modern dandy thief to make his escape, but it was as wide as a barn and no match for his rifle. Having led his men to the fairgrounds to investigate the heist at the mummy exhibit, Captain Phipps treated his men to a large puff of cotton candy as their quarry drifted back to earth in their punctured escape vehicle. His dessert burst from pink to red, followed by a pain in his chest. The mummy burglars had a rifle of their own and weren’t being captured alive. Woke up to see I'm author of the month on OpenBooks.Com. Figured that was a good a time as any to write a new blog post for the site. I happened to be up at midnight when Microcosms posted this week's prompt. Expecting a hostile boarding, Admiral Graham was instead greeted by a pirate vessel manned by a five corpses and no clue how the criminals came to find themselves dead. “Sir!” Lieutenant Harold called, holding out a small note and a wide-mouthed glass bottle. You took is from our home. “There’s this too.” Graham looked up from the note to Harold’s open palm where there were two long iridescent wings, bloodied at the ends where they’d been ripped off their fairy’s back. I continue to knock out a blog post a week over at OpenBooks.com. This week I fish for feedback on other writers keeping their work/family/writing lives balanced and separate from one another.